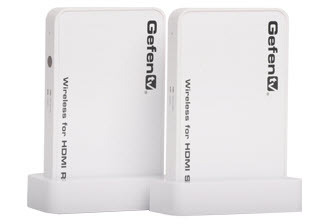 The GefenTV Wireless for HDMI Extender LR (GTV-WHD-1080P-LR) is a wireless HDMI (WHDI) and IR extender solution comprising a wireless audio / video transmitter and a wireless audio / video receiver. Unlike older/less expensive solutions, the Gefen product does not require line of sight between transmitter and receiver, so is capable of transmission through walls and between floors. One of the unique features of the Gefen product is the ability to switch the receiver between up to 8 sender units. The transmitter and receiver both contain a single HDMI input. The transmitter also contains a socket to plug in an IR emitter for control of the source device. The receiver also contains a USB port for service. The product also includes a remote control for switching sources. Both transmitter and receiver contain mini-USB ports. On the transmitter this is labeled “service” so is presumably for firmware upgrades. On the receiver, it is used for power. The product lists for $399 on Gefen’s website, but can be found online for under $300. The units are housed in sturdy plastic cases with LED’s indicating link status and video. Two docks are provided in the event that the units need to be freestanding and vertical. Both units are solid-state devices, so there’s nothing to make and noise and they both run very cool, so there should be little concern about heat output. Setup was a breeze: plug the receiver into the display, then power up the transmitter. The on-screen display provides useful feedback about connection status. In the event that manual pairing is required, there is a pairing button on the front of each unit that can be pressed with a paper clip or other suitable implement. The kit contains one sender and one receiver for connection of a single source to single display device. 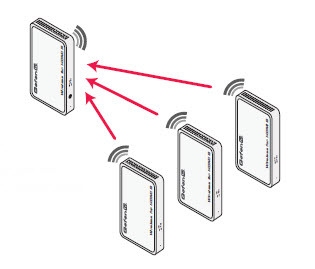 The receiver supports up to 8 senders connected to a single transmitter. The remote contains discrete buttons to select the first three sources and any source can be selected using the on-screen menu. The on-screen menu also allows senders to be renamed so that the correct unit can be identified. I put the product through my usual set of tests at home. My initial test was a Blu-ray playing (The Art of Flight: my new favorite test disc) via PowerDVD 12 on my Core i7 laptop, with line of sight to the receiver connected to my Pioneer Kuro plasma display. Everything worked well. Next I moved the laptop and transmitter into and adjoining room and repeated the test. The picture and sound were still both flawless. Despite this, the picture was still crystal clear on all the Blu-ray's I tested from the basement to the first floor. For the final test, I connected the receiver to the 42-inch plasma in the master bedroom on the second floor and tested from the transmitter in the basement. Once again no issues: just crystal clear picture and sound. With a strong commercial AV switching products, the product performed as expected. With support for multiple senders at this price point, it’s good value. 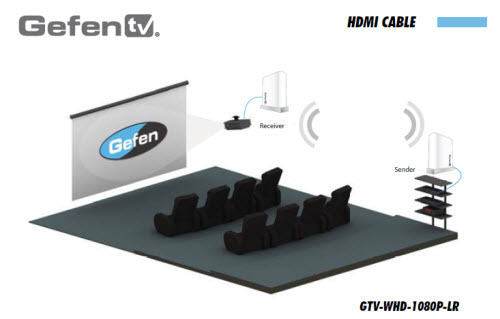 If you’re looking to locate a TV or projector in a place where it would be impractical to run cables, the GefenTV Wireless for HDMI Extender LR (GTV-WHD-1080P-LR) could be the solution. Bottom line: it worked flawlessly in all of my tests, so I’d highly recommend it.